In 1965 Shelby American modified a lot of Wimbledon White fastbacks directly from the San Jose factory with the 271hp(289ci, V8) engine. The converted cars were named the GT-350 because there was 350 feet between Shelby's main assembly line and the engine room. Engine modifications boost its performance up to 306hp with a Cobra aluminum high rise intake manifold, 715cfm Holley four-barrel carburetor, Cobra cast aluminum finned valve covers and 6.5 quart oil pan, steel tubing "Try-Y" exhaust headers, low restriction mufflers, and dual side-exit exhaust pipes. 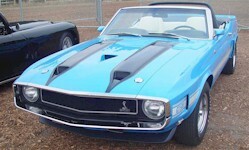 Body modifications included a fiberglass hood with NASCAR-style pins and functional scoop, a cleaned up grille with a mustang logo which will become the 1969 Mustang standard, and all were Wimbledon White with blue 10 inch wide racing "LeMans" stripes. Interior modification included a high performance instrumented dash, a collection of different wooden steering wheels, removing the back seats and placing the spare tire there to classify it as a SCCA racing series sports car, and many others. Shelby VIN plates were affixed directly over the Ford VIN numbers. 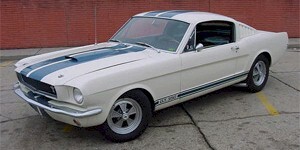 562 units where built in 1965 which included 521 street versions($4547), 34 of the converted cars were named the GT-350R race-prepared models($5995), 4 drag racing versions, and 3 prototypes. The Shelby Motor Company continued modifying Ford Mustangs for the 1966 Model Year. The first 252 units were actually 1965 Mustang bodies with 1965 Mustang trim. They are known as the "carry-over" cars. Two body styles were offered - the fastback and the ultra-rare convertible. Modifications over the 1965 Shelby are minimal - side air-intake scoops were added to force air to the rear brake pads which aided in keeping them cool and the C-pillar sail panel was removed and replaced with triangular windows. The 1967 Shelby was completely redesigned with a fiberglass hood with twin scoops and racing-style lock-down pin, all steel piece deep opening mouth grille with two round high-beam headlights placed side-by-side in the middle (later in the year the lights were separated due to pressure from some state departments of motor vehicles), a single line front bumper with out vertical components, and working protruding rear wheel and rear quarter window air scoops. Early 1967 models had a round red running light installed in the rear opening of the rear quarter window air scoop but was dropped due to legal concerns. The rear of the car has a three piece spoiler and extra wide taillights were mounted on a smooth flat panel. Joining the GT-350 in 1967, Shelby introduced the new GT-500 which packed the 355hp, 425 cubic inch, big-block, V8. Both the GT-350 and GT-500 came only as fastbacks, although there was one prototype GT-500 convertible and one prototype GT-500 hardtop. The 1968 Shelby introduced the newly designed hood which now featured twin scoops at the leading edge of the car and a dual pin and stock Mustang hood lock mechanism. Other changes what a larger grille opening created by a fiberglass front valance panel with the first American twin rectangular driving lights. Just before 1968 Shelby production, the Shelby manufacturing group (Shelby Automotive Inc.) moved from Torrance, California to Ionia, Michigan due to the need for high quality fiberglass as more components required it. This lead to the three Shelby divisions of the Shelby Automotive Inc., Shelby Racing Co., and Shelby Parts. Interesting facts is the fact that some cars came with Ford's tilt-away steering column but was not an option that could be specifically ordered; also all air conditioned models came with tinted glass directly from Ford which was not altered by Shelby. A new 250 hp, 302 cubic inch, V8 engine was offered as well as a 360 hp, 428 cubic inch Police Interceptor V8; and a 335 hp, 428 cubic inch Cobra Jet V8. Mid 1968, Shelby introduced the GT-500KR or "King of the Road" which used Ford's new unofficially rated 400hp, 428 cubic inch Cobra Jet engine along with other handling/safety modifications to contain the power. One of the most popular convertible options was surf board attachment rings located on the top of the roll-bar. The 1969 Shelby looked very different from the 1969 mustang with fiberglass fenders, hood, and rear cap which made the Shelby three inches longer than the already elongated 1969 Mustangs. The hood was fastened with five recessed NASA-type hood scoops. The leading edge of the hooded ended with a chrome strip that wrapped around the grille to meet the thin Shelby chrome bumper. A second chrome strip formed a wide mouth on the grille between the headlamps with Lucas driving lights mounted just below the bumper. The Shelby GT side stripes were wider, centered vertically, and ran the entire length of the car. The rear brake body side air scoops were wider and mounted in the center for the convertible but higher and similar to the 1968 for the fastback. In the rear, Thunderbird sequential taillights were used and a spring mounted license plate frame that hid the fuel cap. Early in the year the dual exhaust tips ended just inches below and to the right and left of the license plate. Later they were moved further out and earlier cars recalled due to a fire-hazard. All of Fords Grabber colors were available as well as the 1968 Shelby colors. All GT-350s got Fords new 290hp, 351 cubic inch V8; while the GT-500s got the 1968 GT-500 335hp, 428 cubic inch, Cobra Jet V8. In the fall of 1969 Shelby decided to stop making Shelby GT and the remaining unbuilt stock of about 789 cars were sold as the 1970 Shelby. In the fall of 1969 Shelby decided to stop making Shelby GTs and the remaining unbuilt stock of about 789 cars were sold as the 1970 Shelby. These cars received 1970 VIN numbers, a set of black stripes on their hoods, a front chin spoiler, and the emissions control systems required for the 1970 model year. This was the last year the Shelby was offered. It doesn't appear again until the 2006 model year. The Shelby is back in 2007 and with a new model, the Shelby GT. The Shelby GT has all the looks of a GT500 but uses the standard 2008 Mustang GT 4.6L V8, H-code engine but adds the Ford Racing air intake to push the power to 325hp and 300ft-lbs. The 2007 Shelby GT came only in a coupe. The 500hp Shelby GT500 is carried over from 2006 and comes in both a coupe or convertible. A variant of the Shelby GT is the Shelby GT/SC where the "SC" stands for the SuperCharged engine. A Limited Edition 40th Anniversary Package was available for 500 units. It was offered to commemorate the 1967-2007 Shelby line. 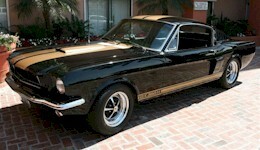 Also 500 black GT convertibles were converted to Shelby GT-H models for Hertz. 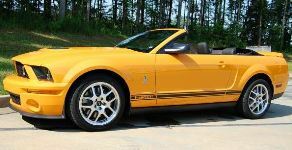 These convertibles have gold stripes, a hood with pins, brushed aluminum grille with offset tri-bar pony emblem, 18 inch black aluminum wheels, Hertz door sill emblems, and standard Shelby GT body and engine upgrades. "The Red package is all about exclusivity," said Dan Geist, Mustang marketing manager. "The Shelby GT500 is an enthusiasts' car. 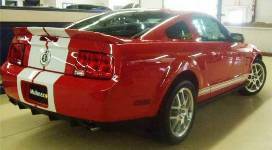 For white or black exterior colors a Red Appearance Package is available for $1650 which offers bright red top and side stripes, inside red and black leather, floor mats that are ebony carpet with red and silver embroidered cobra snake logo, unique red exterior cobra snake badges, and car cover. Joining the Shelby GT-500 and Shelby GT in 2008 are the 40th anniversary Shelby GT-500KR (King of the Road) coupe, Shelby Super Snake GT500 upgrade, and the limited Shelby GT Barrett Jackson edition of 100 cars in black with red stripes. The GT500KR features a forward vented hood, hood pins, unique 18 inch wheels, a Ford Racing engine upgrade allowing for 540hp, and GT500KR badging throughout. The 2008 Shelby GT500 Super Snake is a Shelby factory or aftermarket parts upgrade which added many of the GT500KR features but includes GT500 Super Snake badging and 600 to 725hp of engine upgrades and tuning. The 2008 Shelby GT-500 has a 500hp (at 6000rpm), 5.4 liter, 4 valve, supercharged, V8 engine and comes in a 2-door coupe or a convertible. Seven of the Mustang 2008 colors are offered: Torch Red, Alloy dark gray, Vista Blue, Performance White, Black, Grabber Orange, and Vapor silver. 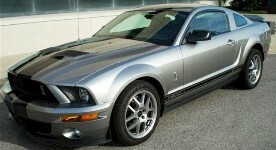 Standard equipment includes: fog lamps, over-the-top racing stripes, GT500 side stripes, Shelby gas cap, unique aluminum hood with functional air vents, front fascia, unique rear spoiler, aluminum interior accent air registers, Shaker 500 Audio System, Sport leather seats, leather wrapped steering wheel, and an anti-theft system. Optional equipment includes ambient lighting, interior upgrade, Shaker 1000 Audio System, SIRIUS Satellite Radio, touch screen DVD based navigation, HID headlamps, and stripe delete options. Also in the Shelby line is the Shelby GT which starts with a Mustang GT premium modified for about $15,000 to include many of the Shelby GT500 options. 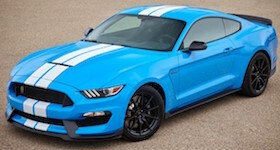 The Shelby GT comes in a coupe or convertible but only in Vista Blue with silver stripes for the standard Shelby GT, coupe only in Grabber Orange with silver stripes for the Shelby GT California edition, and convertible or coupe in Black with red stripes for the Shelby GT Barrett Jackson edition. 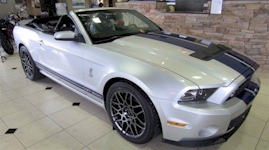 The 2009 Shelby GT-500 has a 500hp (at 6000rpm), 5.4 liter, 4 valve, intercooled, supercharged, V8 engine and comes in a 2-door coupe or a convertible. Just as in 2008 a second model is available: the Shelby GT500KR with the Ford Racing Power Pack upgrade and Shelby tuning of its 5.4L supercharged V8 to produce 540hp. A limited number of black or white Red Stripe Shelby GT-500's were also offered which included red stripes, red snake emblems, and red interior accents. This Red Appearance Package was also available on limited numbers of Shelby's in 2007 and 2008 also. 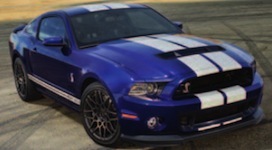 The 2010 Shelby GT-500 has a new look just as the 2010 Mustang V6 and GT. The front fascia continues to have its body colored panel between the headlamps and upper grille but is molded as a continuation of the hood as it is bend around the grille. Just as the 2010 Mustang, the upper grille is smaller, but the lower grille on the 2010 Shelby GT500 is larger, making them relatively the same size. Also new to 2010 is the redesigned Cobra emblem, redesigned body side lower stripes and GT graphic, new rear fascia, new rear wing, and new rear decklid Cobra emblem. For the first time the Cobra GT500 coupe received different wheels than the convertible. Both have the newly designed aluminum 5 double-spoke wheel, but the coupe has a black chrome painted 19 inch version while the convertible has a bright aluminum 18 inch version. The interior is also redesigned with racing striped leather seats, metal dash and steering wheel trim, new instrument gauges, and white shifter knob and color matched stitching. The 2010 Shelby GT-500 has the 540hp (at 6200rpm), 5.4 liter, 4 valve, intercooled, supercharged, V8 engine with the Ford Racing Power Pack and improved Tremec Twin-disc clutch 6-speed manual transmission. Also available in 2010 is the GT500 Shelby Super Snake offering performance, styling, and horsepower upgrades over the standard GT500. The 2011 returns with both a coupe and convertible versions of the GT-500. Race Red and Ingot Silver replace Torch Red and Brilliant Silver. New items include a new aluminum engine block for the 5.4L V8 engine rated at 550 horsepower and 510 ft-lbs of torque, Electric Power Assist Steering (EPAS), integrated spotter mirror within the side mirrors, the glass roof option, and a new SVT Performance Package. This package gives you a 3.73 limited slip rear end, different 19-inch wheels in the front and 20-inch in the rear, special stripes, unique spoiler, special gear shifter knob, and special springs and shocks. A 45th Anniversary Shelby GT-350 in Performance White only is also available. 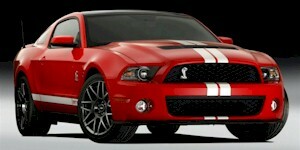 The GT-350 Shelby conversion will be done at the Shelby shop as requested by a new 2011 Mustang GT owner. The 2011 Shelby GT500 Super Snake offers performance upgrades including 660, 750, and 800hp versions! 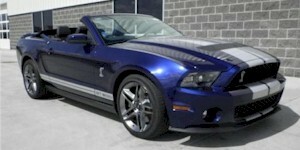 The 2012 SVT GT-500 Shelby is available in both a coupe and convertible versions. New items include new sun visors with a built in universal garage door opener and optional Leather Recaro sport seats with accent stripes. A total of 350 limited edition GT350s will also be produced. They will come only in Performance White with blue stripes, Race Red with white stripes, and Kona Blue with white stripes. They contain either a normally aspirated or supercharged 5.0L engine. GT350s are based on the Mustang GT body and are available in both a coupe and convertible. 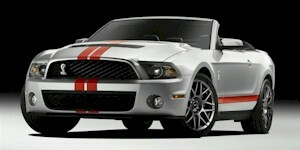 The 2012 Shelby GTS is a $9995 V6 or GT upgrade offered for both the 2011 and 2012 model years as a post title upgrade. It features engine and handling upgrades as well as a unique front fascia, stripes, and badges. The Shelby Super Snake is also available as a post title upgrade to the GT500. The 2013 SVT GT-500 Shelby receives a new Aluminum block 5.8L 650hp V8, new standard wheels, and new instrument panel with "Track Apps" LCD display, and a new blue exterior color named "Deep Impact Blue" (replacing Kona Blue). Also new for 2013 is the downforce-generating front grilles, aggressive splitter, new quad exhaust system and two new forged-aluminum wheels. An upgrade is the 19"x9.5" (front) 20"x9.5"(rear) "Tarnish" Painted Forged- Aluminum Wheels which are part of the SVT Performance Package. The SVT Performance Package includes TORSEN differential with 3.31 axle ratio, unique wheels, SVT Engineered Bilstein Cockpit selectable dampers, unique rear springs, and unique gear shift knob. The 2014 Shelby GT-500 came in both the coupe and convertible body styles. There was only minor differences from the 2013 model; addition of heated standard seats, the removal of the unique spoiler with Gurney flap for the SVT package, and two new colors Oxford White (replacing Performance White) and Ruby Red (replacing Red Candy). The engine has 12 more horsepower and 31 more foot-pounds of torque over the 2013 version. 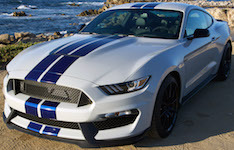 The GT350 returns in 2014 in both the coupe and convertible body styles. 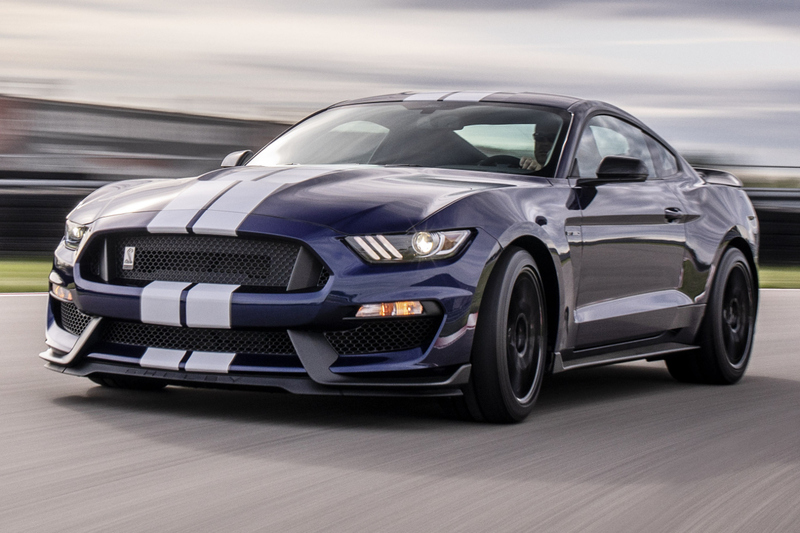 The 2016 Mustang Shelby GT350 has the new 526hp, aluminum block, supercharged, 5.2L Flat Plane Crank V8. There is also a Tremec 3160 6-speed manual transmission. Suspension upgrades include a MagneRide Damping System. Tires are Michelin Pilot Super Sport tires. Wheels include 19" x 10.5" front, 19" x 11" rear ebony black painted aluminum. Brake upgrades include six piston front Brembo and 4 piston rear Brembo calipers mounted to aluminum hats. Other GT350 features include wide aluminum fenders, a unique aluminum hood, front and rear fascias, splitter, rockers, and rear valance with integrated diffuser. On the grille is a GT350 snake badge. There is also a racing performance upgrade package, the GT350R for $13K more. GT350R additions include a MagneRide damping system; Integrated Driver Control (IDC) system; Aluminum tower to tower brace; engine oil, transmission, and differential coolers; heavy-duty front springs; 19" carbon fiber wheels; Michelin pilot sport cup 2 tires (front - 305/30 ZR 19, rear - 315/30 ZR 19); wheel locking kit; carbon fiber rear wing; chin splitter; and unique chassis tuning. To save weight and improve performance GT350R deletes include: rear seat (yep, kids in the back reduces performance, also a passenger but at least they give you an option), rear view camera, air conditioning, auxiliary gauges, floor mats (we all know how heavy those are), tire inflator and sealant kit, audio system (who would want to listen to music when you have that supercharged V8), SYNC, and USB ports. The 2018 Mustang Shelby GT350 comes both as a street (GT350) and a race (GT350R) version. Under the hood is a 526 horsepower, 429 foot-pound torque, 5.2-liter, naturally aspirated, aluminum block, V8. Other performance features include: special flat-plane crankshaft, unique intake manifold with large charge motion control (CMC) valves, high-lift camshafts, plasma transferred wire arc processed larger bores, custom high flow exhaust, dual-mode modes rear mufflers with adjustable valves to control the sound and performance, Tremec 3160 6-speed lightweight manual transmission, high-strength dual-disc clutch, TORSEN limited-slip differential (3.73:1 rear axle ratio), higher volume water radiator, tuned chassis system, unique suspension with new wheel bearings, MagneRide electronically controlled semi-active suspension, Ford Perfomance team designed Brembo brakes, increased steering responsiveness, performance wheels and larger tires, and aerodynamic body changes such as the front fascia, lower hood, vents, splitter, and winglets to name a few. The GT350R has the performance deletes of rear seats, air, audio, aux gauges, rear camera, floor mats, tire fix kit, SYNC and USB port, and aux jack. The R-electronics package for the GT350R adds most of this back.